To fulfil current and future clients requirements, KBSS Engineering has developed a range of mechanical engineering skill-sets that continue to grow. At present, KBSS can repair, replace, commission and service all plant and machine for all types of industrial uses. When supplying these services, opportunities to satisfy other client needs in engineering or staff training are often presented. KBSS has extensive knowledge in all aspects of laser alignments. KBSS teams have aligned many mechanical items including pumps, gearboxes, brush electric motors, GE Frame 6-7 and LM6000 turbine trains. As a part of the laser alignment service, KBSS offer full QA/QC reporting on every alignment undertaken. Mechanical teams are highly skilled technicians that are well trained in the area of stud or bolt stretching. Teams leverage an unlimited supply of KBSS equipment that can be transported for us on site or in clients facilities. Hot tapping, or pressure tapping, tasks can be undertaken by mobilised KBSS mechanical teams without interrupting or emptying pipe or vessel sections. Maintaining operation is critical for most maintenance tasks or modifications, so KBSS always ensures minimal to no downtime. Given that damage to composite components are not always visible to the naked eye, KBSS analyse the extent of damage using extensive experience to ensure bonded repairs for a wide range of industries from oil and gas, petrochemical, mining, steel and power generation. KBSS supplies technicians and management to control the integrity of flanges across various industries across the globe. Flange management services include a full history and QA documentation upon completion. In the process of stud stretching and other tasks, KBSS teams have access to, and are experienced at, hydraulic and pneumatic torque pensioning. With access to an unlimited supply of equipment, teams will readily leverage these resources to ensure the most efficient, high quality outcome. Technology and experiences allows KBSS to provide quality heat treatment services to projects ranging in size and urgency. With access to the newest equipment available to the market, KBSS can provide ‘pre’ and ‘post’ heat treatment of welds, and heat treatment for stress relieving in the areas of metallurgy and more. 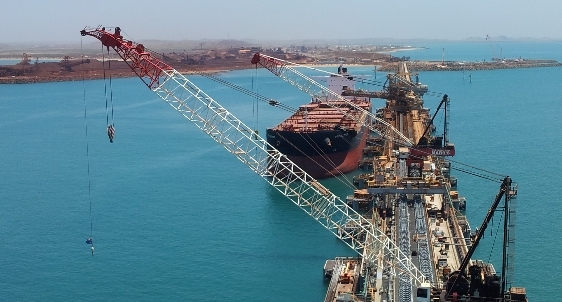 KBSS Engineering were contracted under John Holland to assist in completing their mechanical package on Cape Lambert CLB wharf. KBSS was initially engaged to focus on select machining tasks, laser alignment and documentation. Due to the high quality of work and efficient work ethic, project requirements grew extensively to call upon technicians in welding, rigging, scaffolding, painting, carpentry and more.